It was seven o'clock of a very warm evening in the Seonee hills when Father Wolf woke up from his day's rest, scratched himself, yawned, and spread out his paws one after the other to get rid of the sleepy feeling in their tips. I liked certain stories in this collection, but others not so much. I'd read the first Jungle Book before, but I didn't really remember much going in, and I was pleasantly surprised by how charming Mowgli's story was (if a bit violent). The dialogue is quite amusing in an old style way, and I was enjoying such exclamations as "by the Broken Lock that freed me, thou art no slow goer!" Mowgli's stories were certainly the best ones; I also enjoyed "The White Seal" and "Rikki-Tikki-Tavi". However, some of the other stories were pretty uninteresting and confusing. I can't imagine young children finding them entertaining; I certainly didn't. The tone Kipling took started to get boring and downright annoying after a while. That's not to say that the book is all bad; on the contrary, some of the tales are positively whimsical, particularly the ones with Mowgli and Shere Kan. I also enjoyed "Kaa's Hunting" which has Mowgli, Bagheera, and Baloo as well as Kaa, the strange and hypnotic snake. I believe in the Disney cartoon he is cast as a villain, but in the original story he actually helps rescue Mowgli from the Bandar Log, However, he's definitely portrayed in a sinister light, hypnotizing the monkeys with his eyes and conducting a frightening death dance of sorts. I certainly wouldn't want to have Kaa as an enemy. I found it quite interesting that there is a very fixed code or law in the jungle that all the animals, predator and prey, (except for the Bandar-log, the monkeys) must follow. There are certain rituals and greetings for each people, and everyone seems to have a role to play. This could perhaps be connected to Kipling's colonialist views (as in, Indians and whites are different, each with their own fixed place in society), but I also just found it intriguing on its own. The life in the jungle is hard and rather cruel; those who break the rules of the jungle do not fare well, but if they are followed, the animals generally co-exist with one another at least somewhat peacefully. In one of the stories a Water Truce is declared because of a huge drought, and predator and prey alike come to the water hole and converse freely. When Shere Kan the tiger comes to drink, however, he is shunned and the other animals are disgusted by him, for he has broken a rule by eating Man, doubly so because he ate for pleasure and not food. In the eyes of the other animals, the water is tainted by him drinking there. Kipling creates some interesting sounds and words by transcribing the animal language. Some of the sounds are quite whimsical, and I enjoyed reading them. I will admit that I skimmed through a few of the more uninteresting stories, so I haven't really read this book cover to cover. Close enough though. 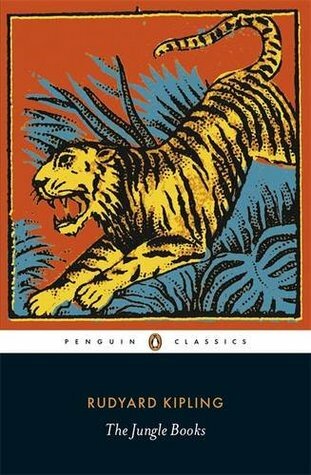 I suppose I would recommend The Jungle Book(s) since they are so famous, but these stories weren't all great.